McFarlane Toys have a long tradition of producing high quality toys and figurines based on popular genre films and television. The quality of the build is generally high and given the price, and the oft times controversial nature of some of the products, means that these are generally made for adults. 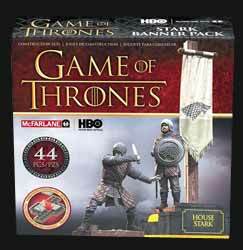 To coincide with the return of the show, McFarlane are releasing a number of Game of Thrones construction kits. Specifically we will be looking at the Stark Banner Pack. When it is finally constructed you get two banner men, approx. 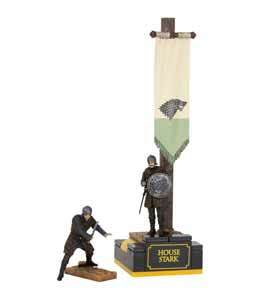 two inches high as well as a plinth which supports a single banner man and the House Stark Banner. Opening the rather sturdy cardboard box reveals four plastic pouches, containing various amounts and types of pieces, the whole thing comes with forty four piece, which gives the impression that it will take a little time to construct, I had mine completed in under five minutes. The box also contains two pieces of paper. The first is the visual construction information, which also tells you what pieces should be in your box and their individual number. This turns out to be a useless fact as the pieces are neither numbered nor are they logically packed together. Parts of both bodies and display which will eventually be joined together are in different pouches. The second piece of paper is a Todd’s tip for increasing the height of the banner post. This is not so much a tip as a necessity because it you don’t increase the height then the banner man stands in front of the banner obscuring the house Sigel. Construction is fairly straightforward if done in a well-lit room on a flat surface. The lit room because it can be difficult to distinguish between some of the dark coloured pieces, the flat surface because even after construction it does not take much pressure for the piece to start to come apart. The base is constructed of good quality pieces, which the box euphemistically, points out, will integrate with other well-known manufactures of plastic bricks. The banner men were easy to assemble, but as these were constructed of a less rigid material you needed to work at the figures to get the arms in and even then I’m not sure I was impressed that much by the fit. Which brings up the odd point of just who are these aimed at? Game of Thrones is, on any measure, a program designed for adults, therefore you would not expect manufactures to put out a lot of material for a younger market where quality may not be such an issue. If these are aimed at adults, especially ones that have either seen or already own some of the high quality figurines from this manufacturer, then I think the adults are going to be disappointed unless the retail price is pretty low. Overall a bit of an oddity. The finished product is too unstable to warrant being called a toy nor does the final quality warrant being viewed good enough to be a display item. That said, this is one of the cheaper starter kits that they do so it might be worth checking out other stuff in the same line.